Though spring takes its first tentative steps across my humble patch of tundra my body feels none of its warmth, my mind in no way revels with thoughts of nature’s rebirth, and my very soul lies locked in a dark and fearful fury. As I compose this season’s opening update my fingers fairly tremble atop the keyboard, so astonishing, so incredible, so horrific is my news. Was it just five months ago, while this website slipped with my garden into blessed, albeit frozen, slumber, that I was contacted by Dr. Hertzberg? It seems like five years instead have passed since that gray November day. How he found me, why he chose me, I know not. All I know is that my life has been forever changed. Was Dr. Hertzberg indeed head of a secret government agency, I first asked myself? I have always scoffed at the notion that such clandestine organizations exist, especially under the auspices of the US Department of Agriculture, as Dr. Hertzberg implied. Covert research on red plastic mulch around tomatoes, that was right up the Department of Ag’s alley, but night vision goggles trained on shovel-toting extra-terrestrials? One can sense the cause of my acute skepticism. Still, since childhood I’ve never turned down a free flight in a private jet, and my meeting with Dr. Hertzberg in Washington was brief and to the point. His “agency,” and its primary cause, the Crop Circle Project (CCP), had been secretly formed in 1977 as the brainchild of President Jimmy Carter. Their objective was to identify, once and for all, who (or what?) was creating the bizarre crop circles that had started popping up in farmer’s fields, from Kansas to Georgia, and from England to The Netherlands. President Carter was particularly miffed about the several hundred bushels of peanuts laid to waste in his own Georgian fields, though he had initially scoffed at the notion that the three large, spiraling circles found on his property were created by alien life forms from distant galaxies. The president suspected they were merely the result of his brother Billy doing drunken donuts in his pickup during a blissful midnight blackout. But then more crop circles appeared, in the next county, over the same period in which Billy was doing a little cell time in Macon. Clearly something was afoot. 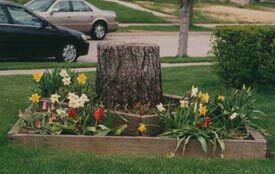 Dr. Hertzberg had discovered my many published papers on the mystery of tree circles, those odd occurrences in residential yards where perfectly lovely, healthy trees are suddenly circled around the base by all manner of unnecessary, garish accouterments. 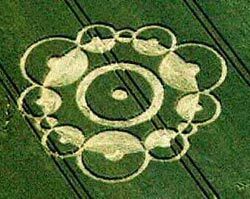 Could these two eccentricities, crop circles and tree circles, somehow be related? I was given a physical, an oath, an expense account, and a gun, and assigned to head the newly formed TCP, or Tree Circle Project, thus freeing up Dr. Hertzberg to devote all his energies to his continuing investigation of crop circles. I have spent the past five months in this formidable capacity; if I was a little late in answering your e-mails over the winter, I trust you understand. Since November I’ve logged more miles on small, sputtering aircraft than John Kerry, crisscrossing America from Seattle to Miami, from Albuquerque to Portland, Maine. As new reports of tree circles would come in, off I’d go. The reports were always the same: homeowners across America waking and throwing open their blinds to discover that sometime in the night, their oak, or elm, beech or basswood, maple, birch, spruce, linden or magnolia, had been tightly circled around the base, by … what? Teenage pranksters from across the street, or terrestrial jesters from Jupiter? This concept of illegal aliens doing landscaping is, of course, nothing new– hell, I’ve hired them. This, however, was different. We were after real aliens, marauding botanical space bums, ET with an on-line degree in bad horticulture. 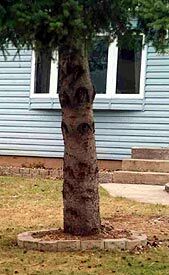 As my research progressed and the patterns emerged, I was left with only one possible conclusion: the heinous tree circles we witness in yards across America are unquestionably being created by beings from other planets. You are the very first among the public to read this information and view the pictures that follow. In my report to President Bush I noted that these tree circle attacks lack any meaningful aggression on the part of the aliens. Fiendish though they appear, they are what we would refer to as whimsical pranks, performed at night when the occupants of the alien spacecrafts that continuously monitor our planet feel the need to get out and stretch their legs. They mean us no harm, and, superior intelligence or not, it is my strong belief that these creatures are probably unaware that fairly often the tree circles they leave behind do irreparable harm to the trees, by raising soil levels around their trunks. The aesthetic damage imposed, it goes without saying, is of even graver consequence. The Homdepotians – By far the most prevalent practitioners of these pranks. 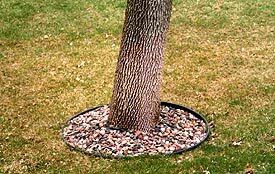 Homdepotian tree circles (HTCs) are identified by use of curving sections of reddish brown, tombstone-like material as edging, filled to the brim with 1 – 2” white rock. Though resembling colored concrete, exact composition of this edging material is unknown to us. What we do know is that they are of a particularly unstable nature, and prone to frost heave. Lab analysis further confirms that the white rock placed inside the ring is not indigenous to planet Earth, and is no doubt dumped into landscape supply yards by the Homdepotians under cover of darkness, for later use. HTCs are usually placed one to two per yard. 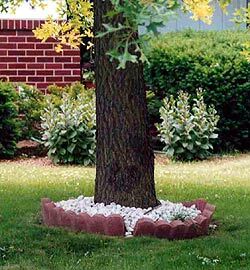 The Anchorians – Anchorian tree circles (ATCs) are always of uniformly small diameter, regardless of scale of yard or size of tree. 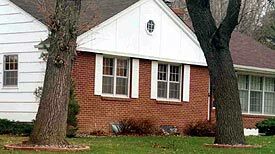 ATCs are noted for their use of small, rough, concrete-like blocks of brittle matter that very often match perfectly the actual concrete retaining wall product used previously by the homeowner in some misguided attempt at foundation landscape design. I theorize that the Anchorian ships have on-board manufacturing capabilities that allow them to match the color and shape of the concrete products used previously by humans elsewhere in the yard. The Clayzians – Note the similarities, yet important differences, between Clayzian tree circles (CTCs) and ATCs. A discerning eye will note that the inert, dense, straight-edged material used to circle the tree is just a bit smaller and smoother than those used in ATCs– more brick-like than block-like. 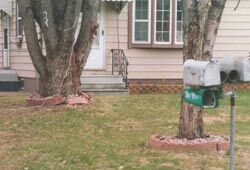 As with ATCs, it is obvious the Clayzians possess on-board manufacturing capability to perfectly match the size and color of their “brick” to the real bricks used in construction of the adjoining home, thus creating the illusion that the tree circle was purposely created by the homeowner or builder, using leftover brick! Most often found as doubles or triples. Glacialetian tree circle, Mequon, Wisconsin. 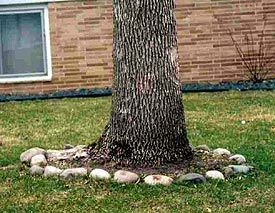 The Glacialetians – Tree circles installed by the Glacialetians (GTCs) are the least oppressive of all tree circles, for they are made with indigenous fieldstone beamed up from area construction sites, lake bottoms, and riverbanks. GTCs vary greatly in diameter; there is one in Adel, Iowa measuring nearly sixteen feet across. 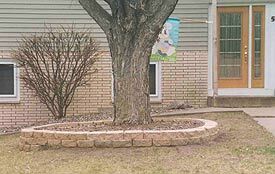 A fresh Polyvinchloridian tree circle, probably installed as training exercise by alien children while the adults created larger PVCTCs in adjacent yards, Milaca, Minnesota. The Polyvinchloridians – Activity by the Polyvinchloridians appears to be waning since the early 1980s, though I have personally performed carbon tests that date several New Jersey Polyvinchloridian tree circles (PVCTCs) to as far back as 1956. 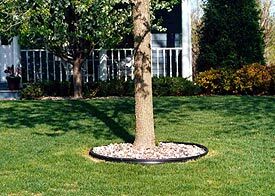 PVCTCs occur when Polyvinchloridian ground crews circle the tree with a semi-malleable, 4” wide, black edging material nearly identical in composition to plastics fabricated here on Earth. 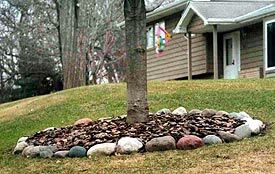 The circle is nearly always filled with indigenous, multi-colored, 1/2-1” river rock sucked from the bottom of Lake Superior, though on the East Coast the circle filling tends toward shredded bark, and on the West Coast, colored rubber mulch. 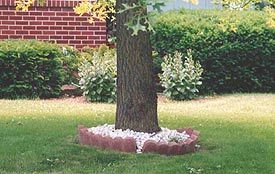 Early discovery of PVCTCs was responsible for the inception of what we now call black plastic edging, used by homeowners to keep grass lawns from growing into garden beds. Right, a prime example of an older Aureolian tree circle, Billings, Montana. The Aureolians – The only alien intruders to circle trees with plant forms, Aureolian tree circles (AUTCs) are nearly always comprised of a tight tutu of hosta dug up by Aureolians from elsewhere in the homeowner’s yard. 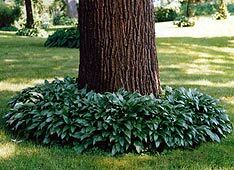 Aureolian tree circles tend to occur in yards where the homeowner has invested in far too many hosta to begin with, such that they are rarely missed. 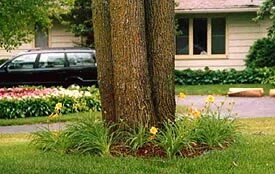 When in a particularly foul mood following a long journey through space, the Aureolians have been know to circle their victim’s trees with daylilies. Note the decidedly blue-collar, hillbilly-esque qualities of this double Walmartian (NOT Homdepotian) tree circle, Rogers, Arkansas. 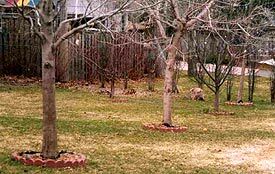 The Walmartians – Though a matter of some debate, I am convinced that a newly discovered alien race, the Walmartians, have recently entered into the tree circle picture, not only pulling a prank on human homeowners but tweaking the noses of their longtime rivals, the Homdepotians. While at first glance this photo appears to be a marvelous example of a double HTC, you will note that instead of the trademark Homdepotian use of pricey, alien white rock (incredibly expensive, after adding the “trucking” charge for transport across 630,000,000 miles), Walmartian tree circles (WTCs) are filled with rather drab, inexpensive, indigenous gravel, scooped up via laser beam from the driveways and fire pits of Arkansas trailer parks. That just smacks of the Walmartians, who seem to live for the chance to do things cheaper than the Homdepotians. As you can see, I’ve been busy. Now it’s your turn. I need your help. If you stuck beside me this far, please volunteer to take the following test. Below are eight random photos of tree circles from across America. Look closely at each while trying to name the alien life form responsible for their construction. You may at this time scroll upward to refresh your memory about each alien group, and the aesthetic qualities comprising their tree circles, but please, no reverting back to these descriptions once you have begun the test. Answers are at the bottom. H – Human; I inserted this one in an attempt to throw you off. This contraption was fashioned by a human homeowner; the aliens may be practical jokers, but they aren’t this mean. 0 – 1 correct: Start paying attention, dammit. This is a matter of grave national concern. If new to the site, spend some time here; you’ll soon see I take my horticulture very seriously. 2 – 4 correct: Not good enough. Start over at the top. 5 – 7 correct: You show potential for this line of work; stick with it. You could soon be recognizing tree circles with moderate extra effort. 8 correct: Your country needs you. I need you. Be on the lookout for tree circles in your area. If found, attempt identification, shoot a photo, then send it to me (jpeg) via this website. I’ll include it in my soon-to-be-completed Tree Circle Gallery. Include city and state. Try not to include homeowner’s address numbers in the photo. 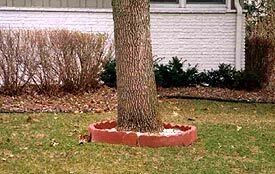 Homeowners who have been made victims of alien tree circles often fear future alien abduction, though the two activities are wholly unrelated. This concludes my report. I feel somewhat calmer now, knowing that I have shared my secret with the nation and the world. I just received a phone call from my esteemed associate, Dr. Hertzberg of the CCP. He will be holding a press conference later this afternoon, and wanted to share with me in advance his findings concerning the origins of crop circles. He has concluded without a shadow of a doubt that crop circles are created by college engineering students.